I am not colorblind, I am Color-I-Don't-Care. Do I know endurance fashion? Yeah - just ask anybody! It's been brought to my attention that, um, how do I tactfully put this... my clothes and colors sometimes don't go together. Clash is a word I've heard. 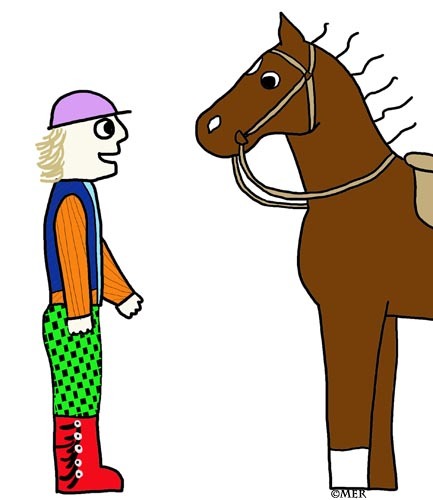 Green checked tights, red and black half chaps, light blue shirt (with pocket), orange long-sleeved striped shirt (with pockets), dark blue cool vest, lavender helmet... what's the problem? Or it might be red tights, blue half chaps, black winter jacket over brown fleece jacket (with pockets) over light blue fleece jacket (with pockets) over purple shirt (with pocket) over long-sleeved light green shirt, dark green helmet. Is there something wrong? I also often wear socks that don't match, but that makes total sense, as I have another pair, exactly like them! I'm all about comfort and utility, which means warmth and fleece and pockets in winter, and coolness, sun protection and pockets in the summer. Even when I wear regular clothes out in the real world, I just can't seem to look like normal people do. I always look kinda… jumbled and inelegant. I have a friend who writes the blog WhatIWore2Day. She always looks terrifically fabulous (and I cannot fathom how she puts her cool outfits together), and I figure if I ever become concerned and really need to look politically correctly fashionable, she can become my consultant. But I have no problem with my non-style, even if people's eyes do sometimes explode. The horses I ride down the trail don't care. It all proves that I am not colorblind, I am Color-I-Don't-Care. And you can take this Endurance Fashionista's word for it. Even on my best day my horse still looks better. That's all that matters to me! Everyone makes a fashion statement. Mine tends to be "I dress in the dark"